An American diplomat is forced to confront the devastation of her past when she is assigned to remote northern Afghanistan. Twenty-one years ago, diplomat Angela Morgan witnessed the death of her husband during the bombing of the U.S. Embassy in Beirut. Devastated by her loss, she fled back to America, where she hid in the backwaters of the State Department and avoided the high-profile postings that would advance her career. Now, with that career about to dead-end and no true connections at home, she must take the one assignment available-at a remote British army outpost in northern Afghanistan. Twenty-one years ago, diplomat Angela Morgan witnessed the death of her husband during the bombing of the U.S. Embassy in Beirut. Devastated by her loss, she fled back to America, where she hid in the backwaters of the State Department and avoided the high-profile postings that would advance her career. Now, with that career about to dead-end and no true connections at home, she must take the one assignment available-at a remote British army outpost in northern Afghanistan. Unwelcome among the soldiers and unaccepted by the local government and warlords, Angela has to fight to earn the respect of her colleagues, especially the enigmatic Mark Davies, a British major who is by turns her staunchest ally and her fiercest critic. Frustrated at her inability to contribute to the nation’s reconstruction, Angela slips out of camp disguised in a burka to provide aid to the refugees in the war-torn region. She becomes their farishta, or "angel," in the local Dari language-and discovers a new purpose for her life, a way to finally put her grief behind her. Drawing on the experiences of the author as a diplomat in Afghanistan, Farishta is a deeply moving and fast-paced story of a woman struggling to move beyond a past trauma, and finding a new community, a new love, and a new sense of self in the process. Patricia McArdle is a retired American diplomat. Her debut novel Farishta, which won the 2010 Amazon Breakthrough Novel Award Grand Prize for General Fiction, was inspired by events that occurred during the year she spent in northern Afghanistan with a British Army unit. From 1979-2006 she worked overseas and in Washington D.C. as a member of the U.S. diplomatic corps. Before joining the Department of State she served for three years as one of the first two female Naval Officers at a remote U.S. communications base in Morocco. Prior to her military service, she spent two years as the only Peace Corps volunteer in a small village in central Paraguay. Afghanistan is an important backdrop and character in Farishta. How do the physical and political landscapes manifest themselves in the narrative? Discuss how the landscape shapes the characters and vice versa. One of the most important moments in the book is when Angela monitors the elections. Do you remember the first time you voted? Think about what it means to vote. How do the people Angela encounters treat this right? At the start of Farishta, Angela looks at photos of her late husband for solace and grounding. What is the function of grief in Angela’s life? In the plot of the novel? How does her time in Afghanistan change her perception of loss? Give examples. Much of the information in this novel was informed by notes that the author took while she was a Foreign Service officer in Afghanistan. Before writing the work, McArdle considered making it a memoir, but ultimately opted to tell the story in fiction. How might the book have been different as a memoir? Discuss the strengths of each form. Discuss the portrayal of female Foreign Service officers in Farishta. What questions would you like to ask McArdle about her own experiences? Love—and the possible loss of it—weaves a consistent thread throughout the narrative. How does the backdrop of war relate to the burgeoning romances readers witness in Farishta? Talk about Nilufer’s and Angela’s paths to love and partnership. During her time in Afghanistan, Angela takes risks and pushes the limits of State Department policies and local culture. Give examples. Compare Angela’s sense of defiance with that of her colleagues in the Foreign Service and that of women and men in Afghani society. “Farishta” means angel in Dari and in Persian. To what extent does Angela act as an angel during her tour in Afghanistan? Which, if any, of her actions are heroic? How else might you classify them? How does placement in Afghanistan affect Angela’s internal life, her external behavior, and her outlook on the future? Compare McArdle’s portrayal of Afghanistan to what you have heard in news reports. What similarities stand out? What differences do you note? How does the medium of fiction change how you feel about what you read? 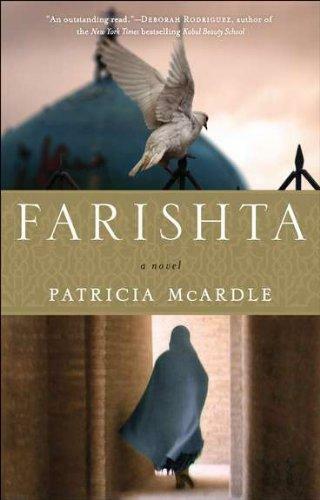 Farishta juxtaposes the lives of American and Afghani women. What clashes—external and internal—arise? How does the novel depict the relationships between American women and Afghani women in the developing world? Discuss the freedoms and restrictions of each group. Burkas and body armor are necessary accoutrements in Afghan society. What role do they play in the action ofFarishta and the day–to–day lives of Angela and other characters? What other symbols are used to represent femininity, womanhood, and feminism? At the end of the novel, Angela is forced to wrangle with another round of intense grief and decision–making. Why do you think McArdle chose to guide her main character through such a staggering chain of events?